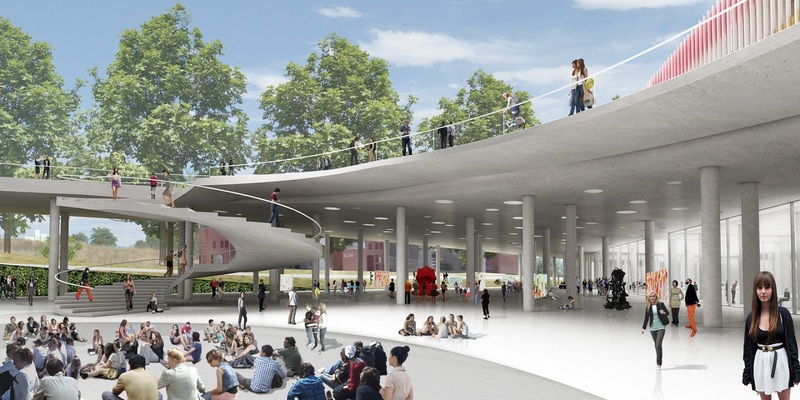 This study is a proposal for the architectural competition of ideas for the School of Fine Arts, organized by the Aristotle University of Thessaloniki. Questions on the structure and the identity of a university school were raised at the very beginning. Is it a space for research and experimentation? A place for free exchange of thought and birth of knowledge? An accumulation of public buildings? A container of human relations? Or all of the above? The public space, in which human relations and actions evolve, is crucial for the identity of a School. It is a womb that generates ideas; and so is Art. In the proposal, the basic road that bisects the site today is translocated, allowing for the creation of a vast unified area for the four new departments, with a dynamic façade towards the central artery of the city. 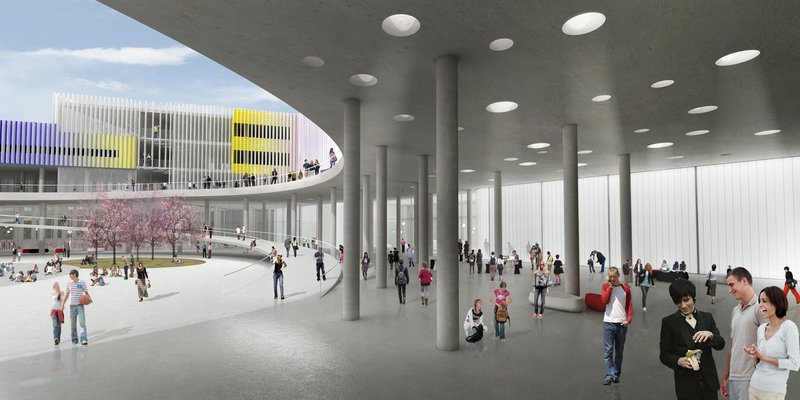 The programme consists of two categories of spaces: unique spaces of special requirements –such as the theatre and cinema auditoriums- and standardized spaces with repetition –such as classes, laboratories, offices. Special spaces are placed in a rigid concrete base, which creates a gently inclined piazza on its upper side and a second, partly covered, piazza on its lower side. 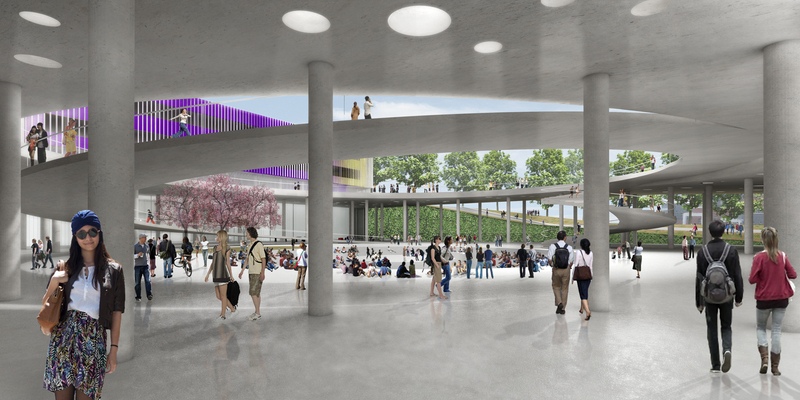 Both piazzas are visually and spatially connected through a large circular void, concentrating all movement and acting as a core, through which the academic community breathes. Standardized spaces compose a flexible ribbon (15 m thick) which unfolds on several levels and encloses the central piazza. Parts of this unified ribbon are attributed to each department, according to their needs. Thus, a methodological tool is proposed, as a matrix –in its mathematical sense- which allows for standardization and differentiation as time passes. 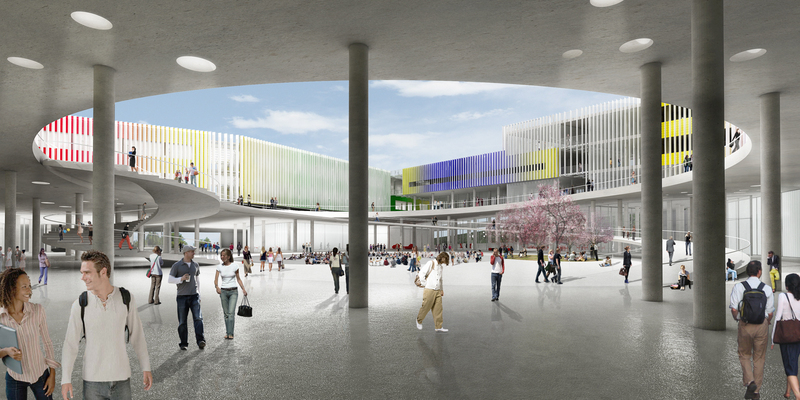 Colour is incorporated in this project for the separation of the 4 departments. White louvers envelop the mass, reflecting those different colours, concealing, revealing, rotating respectively, following the demands of environmental design.